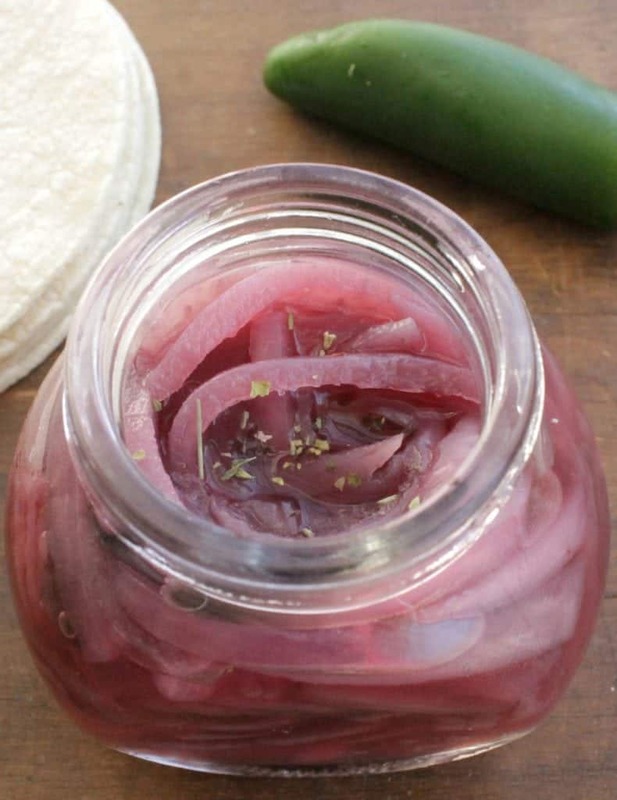 Mexican Pickled Red Onions (Cebolla Morada en Escabeche) is a classic in the Mexican cuisine. A delicious topping that brings a lot flavor to your favorite food. I remember harvest season on my family’s ranch very well. The men had been working for months, and it was finally time to start picking produce. Bust out your best sombrero and shine up your boots. Because it was also FIESTA time! My family primarily grows apples and quince, but there’s also one acre set aside just for the family. That’s where we grow our food – jalapeños, onions, carrots, pinto beans, and more. 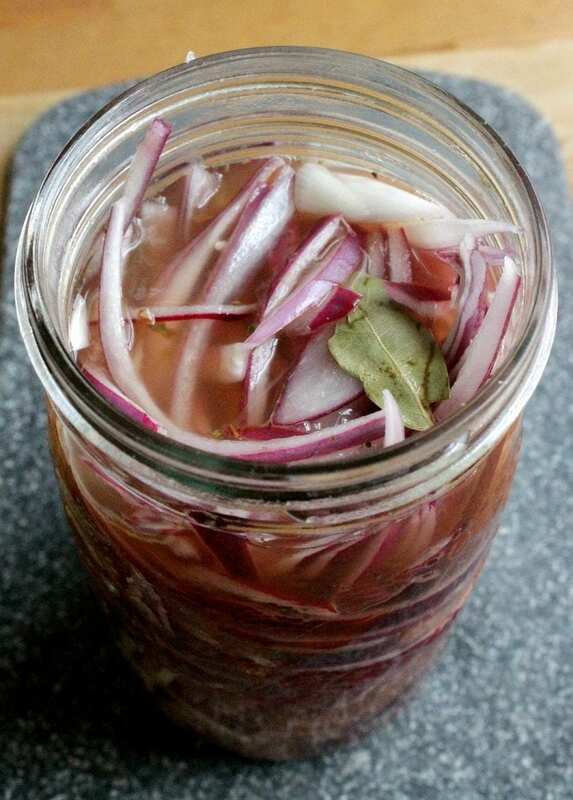 During harvest season, yes, we partied, but it was also time for pickling our food from that one little acre – just like these Mexican Pickled Red Onions, or Cebolla Morada en Escabeche. We love our toppings in Mexico – pickled jalapeños , radishes, salsa , etc. Forget “top of the morning to you.” We’re ready to Top OFF everything in sight. 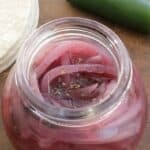 When traveling throughout the country, you’ll find these Mexican Pickled Red Onions, or Cebolla Morada en Escabeche, at just about every taco stand. Sure, you can buy them, but they’re so incredibly easy to make. Why waste your money when you can make them exactly the way you like them? Plus, you can stretch the lifespan of an onion for months. The beauty of making food at home is making it exactly according to your taste. I’m using a red onion and jalapeño. In Southern Mexico, they make Mexican Pickled Red Onions with habanero. That is some spicy stuff! It’s a classic topping for Cochinita Pibil. If you’re not into spice, you can take out the chili pepper. I also added some dried oregano and a couple of bay leaves to the jar . 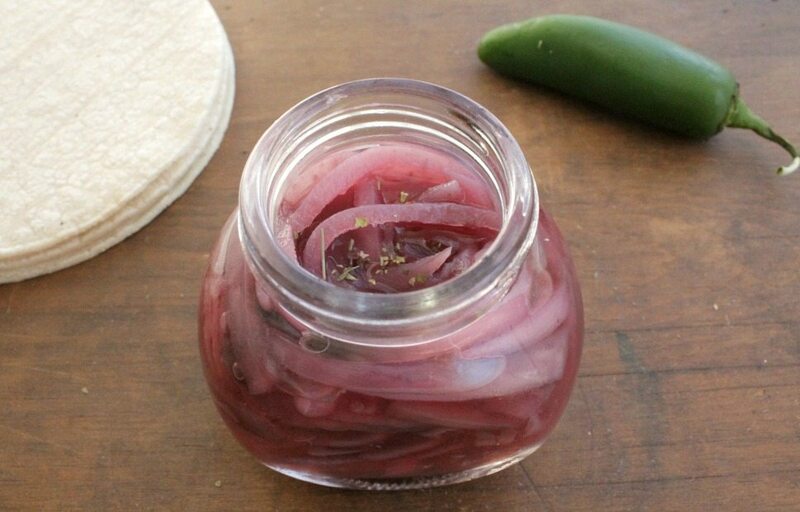 Mexican Pickled Red Onions last a few months in the cupboard. If you open the jar, make sure to store it in the fridge and use it up within a few weeks. After all, no one likes a mushy onion. Add this pickled sweetness to your grilled meats or seafood dishes. You will love the flavor they bring. Hope you enjoy! Bring the water to a soft boil and immediately remove from the heat. Mix the sugar-water with the vinegar, salt, oregano. 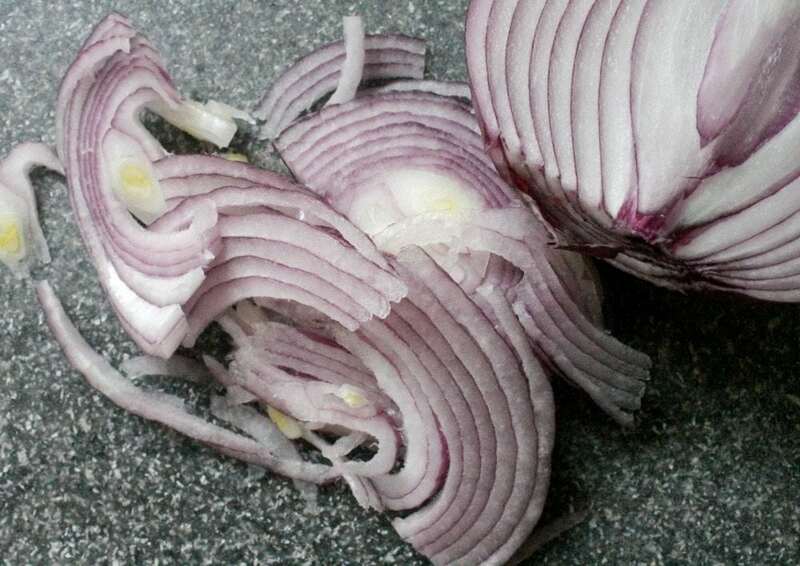 Slice the onion into thin rings. Put the onion slices in a jar. If you'd like the onions to be spicy, add in strips of habanero, serrano, or jalapeño peppers. Pour the mixed liquid into the jar and stir. Close the jar and leave to marinate in the fridge for at least 2 hours. Overnight is best. Note: You might need more liquid depending on the size of your jar. If this is the case, add more water and stir again. Oh yuuummmm!!! Will the taste differ if I use different onions? Yes. I have made this exact same recipe with white onion, and it tasted great! I used your recipe and my jar is in the fridge now. I’m looking forward to trying them! Thanks for the recipe! This looks great! I love pickled onions but I’ve never tried it with habanero or serrano peppers in there. I definitely want to give that a go the next time I make them. I’ll have to monitor the heat and make sure it doesn’t get too crazy, still want my kids to be able to eat them! Thank you again for sharing! These sound so good! I will get together with my sister and make some of these. Do you have a great recipe for the sliced pickled carrots that they serve in some Mexican restaurants? I’d like us to make those too, or can we just use the same recipe with carrots? Thanks!